CMM solves measurement problems of increasing scale and complexity. 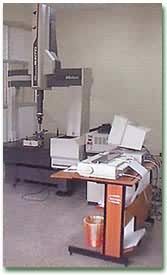 Used for dimensional measurement of machined components, Jigs and Fixures, and patterns. Provides high accuracy and speedy inspection. Equipped with 3 Axis servo control with 360 Degree tilting motorized probe head. Max. Work piece loading 730mm height.